For at least 10 years the new stadium of BJK will bear the name Vodafone Arena. Mobile giant is to pay $11.6 million per year, also acquiring place on the players shirts. Although actual construction hasn't started yet (demolition of the old stadium is ongoing), we already know the name of future Beşiktaş arena. As expected after June's letter of intent between the two sides, BJK teamed with mobile giant Vodafone. As part of the partnership Vodafone will become the shirt sponsor for 3 years (with option to prolong by 2 more), a deal worth $29 million (€22.6m). However, a lot more cashflow is expected from the naming rights agreement, valued at $116m (€88m) over the next decade. This part of the contract also foresees possible extension, for further 5 years. Worth keeping in mind, the stadium naming rights deal is worth similar sum that the stadium construction is expected to consume. 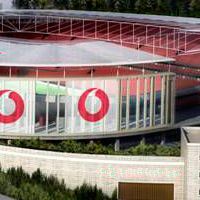 Apart from stadium sponsorship itself, Vodafone is to provide on-site services for BJK supporters, like WiFi and mobile apps, making the club describe it as the country's first 'smart stadium'.